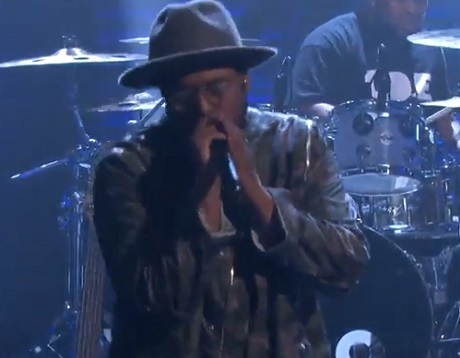 Schoolboy Q celebrated the release of his long-awaited Oxymoron LP yesterday (February 25) by taking his slow-swerving "Studio" to a different kind of studio, namely the California set of Conan. Flanked by a full band sporting Oxymoron promotional tees and singer BJ the Chicago Kid, Q spends the first half of the song performing a relaxed bounce before eventually busting into an edited set of bars about getting his goddess on lock, or at the very least, naked. BJ the Chicago Kid also gets his croon on, while a searing rock-styled guitar solo is sent flying somewhere into the audience. You can check it all out down below. Read our recent interview with ScHoolboy Q here.